The NanoSight instrument by Particle & Surface Sciences offers a unique insight into protein aggregation in the range of 30nm - 1000nm using a new laser-based Nanoparticle Tracking Analysis (NTA) system. Characterising the state of aggregation in proteins is important when trying to understand biopharmaceutical product stability and efficacy. Product quality, both in terms of biological activity and immunogenicity can be highly influenced by the state of protein aggregation. A wide variety of aggregates is encountered in biopharmaceutical samples ranging in size and characteristics. Protein aggregates span a broad size range from small oligomers (nanometers) to insoluble micron-sized aggregates that can contain millions of monomer units. Protein aggregation can occur at all steps in the manufacturing process, storage, distribution and handling of products. It results from various kinds of stress such as agitation and exposure to extremes of pH, temperature, ionic strength or various interfaces. High protein concentrations can also increase the likelihood of aggregation. Aggregation needs to be carefully characterised and controlled during development, manufacture and subsequent storage of a drug substance and formulated product. Similarly, by monitoring the state of aggregation, modification or optimisation of the production process can be achieved. 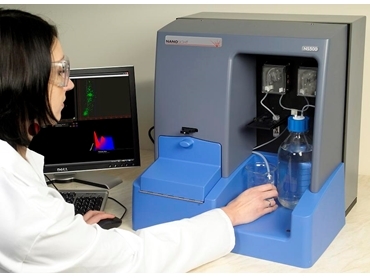 NanoSight technology offers a new laser-based Nanoparticle Tracking Analysis (NTA) system, which allows nanoscale particles such as protein aggregates to be directly and individually visualised and counted in liquid in real-time, from which high-resolution particle size distribution profiles can be obtained. The technique is fast, robust, accurate and low cost, representing an attractive alternative or complement to existing methods of nanoparticle analysis such as Dynamic Light Scattering or Electron Microscopy.